Once a trade has been opened, its initial parameters, stop-loss and take-profit levels, can be altered at any given time. The order-modifying menu can be accessed either by right-clicking on the order in the Terminal window and selecting Modify or Delete Order, or by double-clicking on the S/L or T/P columns within the Terminal window. On the screenshot below you can see the modify screen visualized. In order to change the stop-loss or take-profit levels, the user needs to enter the new values in the corresponding fields Stop Loss and Take Profit and, if they are correct, the Modify button should become active. If the user wants to enter values which are at a certain distance from the price’s current level, he needs to select or type a number in the Level fields and then click the Copy As buttons. This should make the Modify active and clickable. In case the stop-loss or take-profit levels are too close to the current price level, the Modify button will be grayed out and inactive. It will be required to to change the levels from the current price and re-request to modify your position. 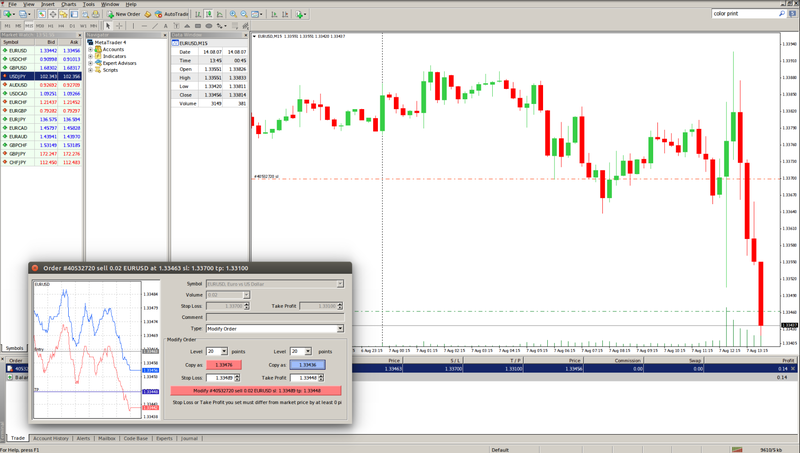 A trade position will be modified after the broker has set a new value for stop-loss and take-profit. The changes will be reflected in the Terminal window’s Trade tab.